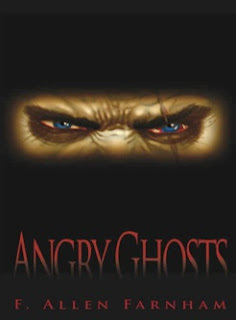 I saw that F. Allen Farnham’s novel Angry Ghosts (Cadre One, 2009) was highlighted recently at Matt Staggs’ blog Enter the Octopus. Indeed, this novel, a micro-press published book, was the winner of a “One-Page Cage Match” defeating the big-time TOR-published Brandon Sanderson novel Warbreaker. I was intrigued by what the writer described as the story’s themes, things such as retaining one’s humanity when survival demands something else, and the concept of violence as a “generational institution.” Allen kindly showed me an electronic review copy of the book, with which I passed the time while doing laundry over the last couple of weeks. Intended as the first in a series, it deals with the aftermath of the near-total annihilation of the human race after an alien invader devastates Earth. Set centuries after this calamity, the story follows the adventures of a cadre of genetically modified, cybernetically enhanced super-soldiers who are themselves the descendants of human colonists elsewhere in the galaxy who escaped the holocaust and managed to keep their existence hidden from the alien enemy. 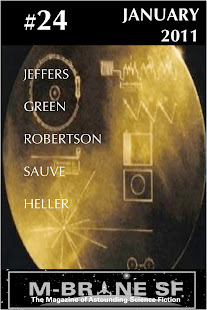 We learn early on that these people live a rigidly regimented subsistence existence, based around keeping their own hidden colony alive by striking out in raids against the aliens to obtain more raw materials, spacecraft that they can salvage and the like. Their methods are stunningly lethal, made so by the absolute necessity of keeping secret the fact that humans still exist. We also get a glimpse of the conflict from the perspective of the alien race, some of whom evidently view what they did to the humans as an atrocity and have begun to suspect that the humans are returning (as the “angry ghosts” of the title) to have their revenge. I’m not going to give away too much of the plot. I will say, however, that the story becomes both more complex and more interesting when a trio of these soldiers (with the rather amusing and pugnacious job descriptions of “Geek,” “Brick” and “Gun”), while conducting what they believe to be an attack on a huge enemy vessel, discover instead that it is a colony vessel carrying a large number of humans. Tragically, the revelation that they have found—for the first time ever—more human beings in the universe doesn’t come until they have killed seventeen of them in their initial bloody incursion into the ship. This event sets up the conflict around which the rest of the story revolves: can these disparate groups come to trust each other and find a way to reunify their long-separated branches of humanity and find a common home together? When we meet the human colonists, it becomes clear just how weird the military cadre has become over time as a result of their survivalist mode of existence. The newly discovered humans are more or less like what we would think of as normal: they eat food grown from plants and animals, they engage in sexual reproduction (rather than cloning), they have conventional family relationships, they value things like freedom of choice and freely express their emotions. All of these things have been either forgotten, suppressed as weaknesses or given up as impossible by the cadre. Together, these wildly different groups may find a way to attempt something previously unthinkable: return to Earth and discover whether the alien marauders are still there. I like military sf generally. Or at least I think that’s generally true. I’m not actually hugely well read in the subgenre, but I have read the major classics of it (such as Starship Troopers, Dorsai!, The Forever War, Ender’s Game and a few others). I like it well enough that I’ve even chosen it as the mode for my own novel-in-progress, Shame. I think some of its appeal must lie in the way a fictional military unit, as a necessarily closed and cohesive system, can be a mirror for the larger society and provide an intimate space to act out some large-scale human drama. It’s an interesting way to put together a tight ensemble of characters and see what they do (ie. putting a bunch of weirdos together and making them all deal with the same situation). I’d judge Angry Ghosts to have succeeded in this regard. Indeed, the drama among the core characters becomes quite engaging emotionally and their apparent destiny by the end of the story is thrilling in a space-war adventure kind of way. For some reason, I never think I’m going to like that when I encounter it, but then after a while that feeling kind of goes away and it isn’t noticeable anymore. And it can contribute to a sense of cinematic immediacy, a “you are watching this unfold right now” kind of vibe. It works decently well for this particular story, which is in fact rather cinematic in its visuals and pacing. Angry Ghosts is available from Amazon and B&N as well as directly from Cadre One. The electronic version is only $2.00, and the trade paperback is $11.99. [Note: When people buy books from small-press publishers, I tend to favor the option of buying directly from the publisher when possible so as to keep Amazon’s grubby paws off of some of the money—in my own case, I get almost literally nothing from M-Brane’s Amazon sales, and offer them only as a public service because I know people like the convenience. ].